My friend Kelly always goes up to Nova Scotia, Canada in the summer. Several generations back, her family came to the U.S. from Nova Scotia. So every year her family, extended family, extended family twice removed, family friends, extended family friends, extended family friends twice removed, and random people like me go up there to enjoy the summer "cottage" life. Every once in a while Kelly would put out the offer for other friends to join her in Nova Scotia while she was there. This year, with no job or limited vacation holding me back, I took her up on that offer. We decided to drive up Betty together from Detroit to Lorneville, Nova Scotia where her family's cottage/farmhouse is located and on the tail end I'd drive back and Kelly would fly. So on Sunday, July 16, we met up in Detroit for some brunch and started our 22+ hour journey in a car that shouldn't go more than 65mph. Kelly got to even ride in the back to see if we could identify the constant rattling noise that just. wouldn't. stop! The first night we stopped in Montreal after nearly 12 hours of driving. Out of necessity we went out for an order of poutine, pickles, and "smoked meats" (pastrami, but check this out for the differences) at Schwartz's deli. The smoked meat was amazing, as was the pickle of course, but the poutine is not something for which Schwartz's is known and that showed a little. On the second day we had another long 11 hour drive ahead as we finished off the journey to Lorneville, rolling up to Kelly's farmhouse late in the evening to a warm welcome from her parents and sister Katie. The next morning I was able to soak in the beauty of the area, which reminded me a lot of Maine and costal UK towns: green hills, farms, sheep, fish, and rocky coasts. During my 8 days there I got a good taste of Kelly's life growing up at the "Scosche" shore. There wasn't enough time for me to go get all the ice cream I wanted from the gas station down the street. The first time we went, after a nice long bike ride through bear infested woods where we loudly sang to avoid conflict, I asked for a maple flavor (when in Canada, eh? ), but was confusedly handed "birthday party" ice cream from the teenage summer hire. That ended up being the best surprise of the week as it was delicious and I was tempted on further visits to just get the same flavor. 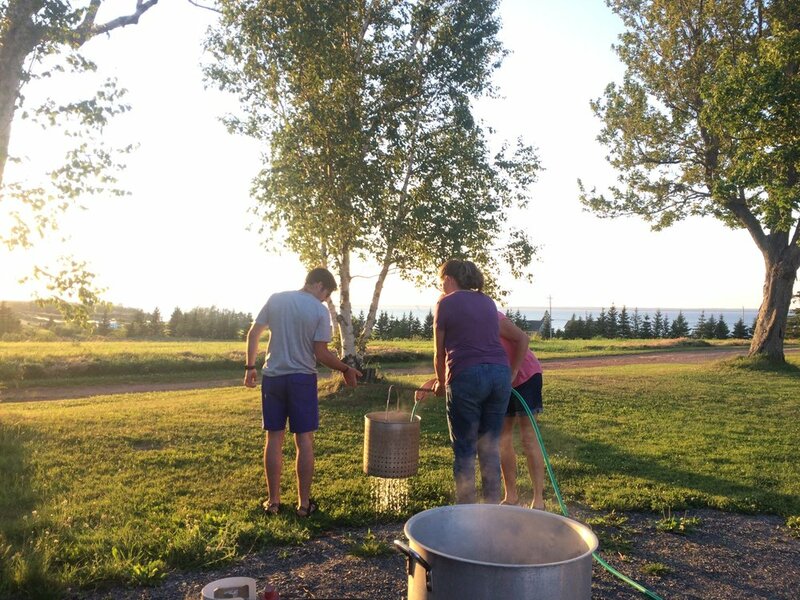 We also enjoyed long walks on the beach during the crazy tides, delicious meals with extended family (including a lobster boil! ), learning how to play cribbage with the aunts, and a visit to Tatamagouche with Kelly's elusive brother Mike and his wife, Jehnna! I say "elusive" because Mike was the only Mahoney I hadn't met after 10 years of friendship with Kelly. Kelly's sister Rachel lives in Madison and I often saw her, Matt (her husband), Daniel, Chris, and John (Kelly's nephews) at church, and also when Kelly would come up to visit Madison. So I felt like I had a special connection to the Mahoney clan and just needed to complete the circle by bonding with Mike (check √). In Tatamagouche, the four of us went to the Chowder House on Main to eat lunch, getting some delicious fish and chips to fit in with the theme of the area. It made me long for days back in Ireland going around to small pubs getting fish and chips and a Guinness, over and over again. So, without the Guinness, we decided to go to the Tatamagouche Brewing Co. after lunch for a little taste, sharing some delicious flights of beer. Following "Tatabrew," we went to Sara Bonnyman's pottery shop in town. Kelly's family loves Sara's work and has several mugs, wine cups, and dishes from her shop in their farmhouse. Kelly wanted to pick up a few things there and I was easily sold on getting myself a few items for the van. I loved her collection with colored glass in the bottom, so I purchased two of her mugs and a set of little tea/whiskey cups. 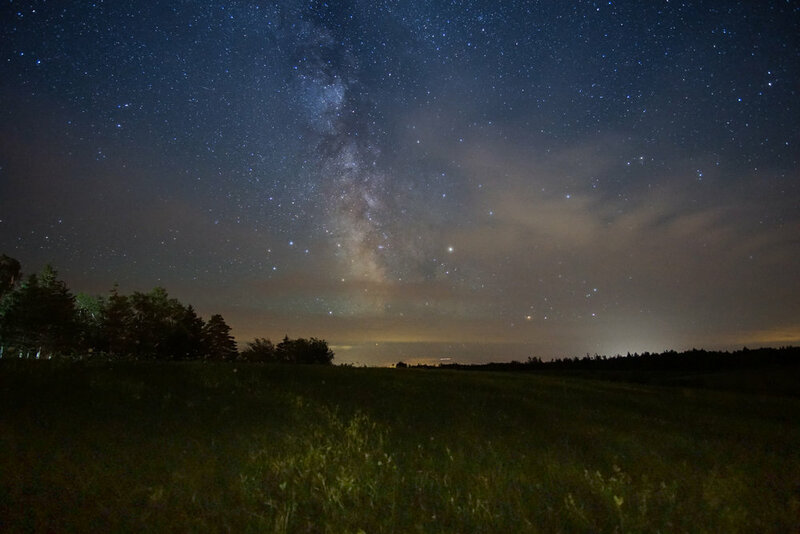 I also took the opportunity in a secluded area, away from large city light pollution, to work on night photography and my settings for aperture and shutter speed. Fortunately I captured a few images of which I could be proud and stitched together a portrait of Kelly's family farmhouse with the milky way rising above it (thumbnail for this post). And as I understand it, that stitched photo now sits proudly on the kitchen wall in the Mahoney household! In the end, my travels weren't without work needing to be done on Betty. While on the farm I was nearly able to complete the wood paneling in the van, which felt great. I couldn't have asked for a more ideal place to work and it was very relaxing spending time there with Kelly's family when I wasn't working. Kelly was very understanding of my need to get work done, so I'm incredibly grateful for her patience with me and for her family opening their home to me. On the way home I had two major stops: Quebec City and the Tecasy Ranch in Trent Lakes, outside Toronto. Quebec just seemed like an innteresting city and a good place to stop for the first night on my way home. Since I was driving solo, I wanted to split the drive into 3 days so I wouldn't get overly exhausted. In Quebec I found a quiet neighborhood street to park/sleep in and in the morning walked around for the first half of the day before getting on my way to the Tecasy Ranch. I just got a taste of Quebec, but it was enough to know that I'd like to go back there some day for an extended weekend to explore it more. 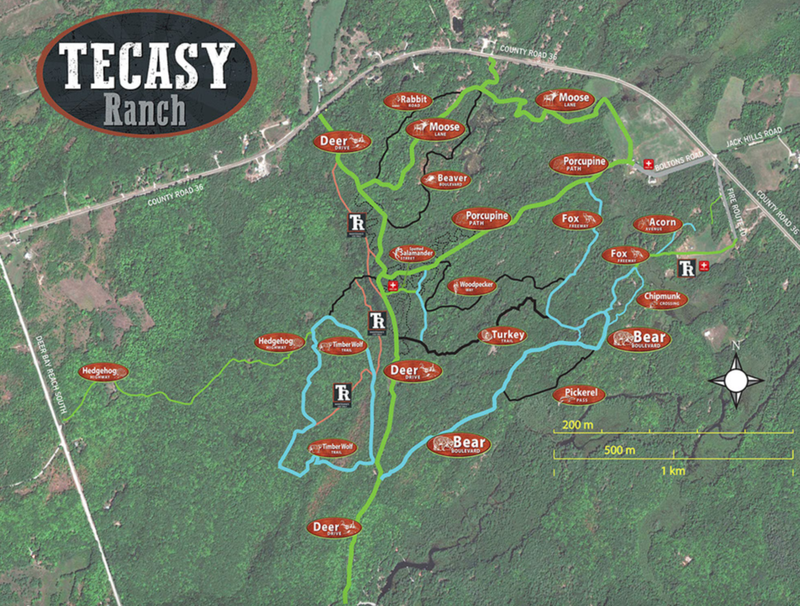 Tecasy Ranch is a non-profit mountain bike trail system located outside Toronto. Don Middleton manages the property, which was originally set aside by Brydon Cruise to be used for boys and girls summer camps. But after realizing the complexities of youth camp requirements, Brydon turned to one of his passions in biking. With Don's help, they're converting the 600 acres into a mountain bike park that will only be used for charity events. Don and Brydon work closely with individuals and organizations who want to host events there, to make sure it's a good fit. This September they hosted an event sponsored by Emily Batty, Canadian Olympic mountain biker, to raise money in the fight against childhood cancer. When I visited in July and did some of the runs with Brydon, Tecasy had over 40km of trails. By the time they finish the trail network, which is being designed with the help of Adam Morka (Emily Batty's coach= and husband), they hope to have over 100km of mountain biking trails. The property will also include a large facility with a mess hall, large kitchen, and showers. They are also adding several dozen Amish built 4-person cabins to the property that will be able to house over 100 people who might be attending an event at Tecasy Ranch. Coming from Quebec, I spent the night at Brydon's lake house and the next morning we took to the trails and got to explore some of the property and see the things they're working on there. It was really awesome to see what Don and Brydon are doing with Tecasy Ranch and see the vision for its future. I'm certainly looking forward to going back for an event once my skills on the mountain bike have improved and more trails are completed. As it stood, Brydon was leaving me in his dust during our few hours on the trails and I was happy to give my thighs a break in the end. After our morning on the trails, I departed Tecasy Ranch and finished the 6 hour drive from there back to Detroit. My time in Canada was great and gave me a good taste of the areas I visited. Enough to know where I'd like to go back, which is part of what this whole year ahead is about. In the moment, I wished I had more time in Nova Scotia to see Prince Edward Island, Halifax, and more. But it's good to leave things on the table (more thoughts on that in relationship to Vermont) and not feel like I have to do EVERYTHING that's out there and available to me. So Canada; Nova Scotia... I'll see you again.